Been meaning to do something for myself lately, and given my love of Dark Souls and GBC limitations, the subject was obvious. I've been wondering on the perspective of the boss room. Back in the day I would have scoffed at all the mixed perspective stuff, but now I think it has a lot of charm ( and more importantly, doesn't use a lot of tiles) but I would love to see any alternative ideas/ examples of other pieces tackling the problem. my ocd has a meltdown with this perspective so due to that id prefer to see it in standard 3/4 view but I dunno what to suggest with that portcullis on the left. from memory those wooden doors should be larger than the other doorways. not much else to offer at this point since im just viewing on my phone. I'm not aware of gba restrictions but cant u squeeze in some more colour per tile and such to enrich it a bit (while keeping an overall dull vibe). GBA != GBC. GBC gets 4 colors per tile and 8 possible tile palettes, so squeezing more colors in is possible but rather nontrivial -- you'd have to get pretty clever with how you setup palettes and the designs you use for tiles. Taking some cues from DB32 palette, DB16 palette or Arne's 16color palette might be helpful. http://gameboy.mongenel.com/dmg/gbc_art.txt shows a lot of useful info. In response to your question Ryumaru, it seems to indicate that you get 8 palettes to display your tiles, but you can swap those out whenever you need to, most likely between levels/screens. Decroded: Heh, yeah, there is no more squeezing. However, if I get what Ai is saying, I can have 8 palettes per area as opposed to 8 palettes in the entire game, so that certainly allows me to play a a bit more with stuff like the torchlight areas. I think what got me started with this Zelda ish perspective is I hate how the conventional 3/4 cant really show doorways and such on the sides of walls. 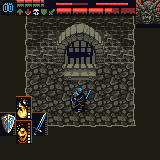 Nevertheless I made a test mockup with the standard perspective in the prison cell, and I might adopt some of it into the boss room. Ai: Thanks for posting that! Do you know anything about the sprites in particular? Can transparency be turned off of sprites to allow full coverage and 4 colors like in my menu? Also been wondering about movement, is it all purely tile based? I'm planning on building the boss in parts,and was wondering if animation could be done by moving those parts pixels at a time, or if it has to be "baked" so to speak into the individual sprites themselves. You can place sprites at any position, but need to keep in mind there is a limitation of 10 sprites per scanline / 40 total onscreen. I speculate that they also have a fixed visual priority (drawn left to right, top to bottom). Someone specifically versed in GBC coding might be able to say for sure, but I'd suggest that actual GBC games would use a combination of real sprite movement, swapping sprites out, and other tricks (like the ability to flip sprites) to accomplish complex animation. This is all taken/extrapolated from the link I gave. I hate how the conventional 3/4 cant really show doorways and such on the sides of walls. Nevertheless I made a test mockup with the standard perspective in the prison cell, and I might adopt some of it into the boss room. u can draw doorways and even doors at the top and bottom and u can certainly imply there are doorways on the sides but its annoying how u cant draw the door itself when it is affects gameplay such as the one on the left. u might be able to get away with drawing the top and side of a door somehow but its awkward so yeah it seems like zelda view is necessary (evil ) here. What will happen to the player when moving through that room with the perspective? will he be seen from full top view? In the image on the right, the south/east/west walls are a third smaller than the north one. (Just scaled as a test, and not cleaned up, but you get the idea, worth experimenting with I think).